NEW VERSION 5 "Classic" NOW OUT! 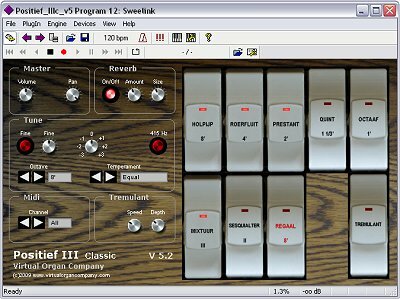 the Positief III from the Virtual Organ Company (VOC) is a fully VST compatible organ that doesn't use samples but very comprehensive additive synthesis instead. The program is therefore small by comparison, and provinding you use an ASIO compatible soundcard, latency is virtually absent. Despite all this, the sound is incredibly realistic, better in a lot of cases than what some existing electronic pipe organs or software produce. Why not check it out for yourself and listen to some of the samples below? The "Regaal" is also something to be heard. This reed voice with very short pipes is modeled on the popular keyboard instrument with the same name of the 16th and early 17th century. Some people find the sound quite repulsive, but I think it is magic, and in full assemble it sounds quite impressive. There are also facilities to to set the overall volume, octave, fine pitch, MIDI channel (including "All"), amount of reverb and room size, and there is a Tremulant with adjustable speed and depth. There is a transposer function and there are also 16 programmable presets, which can be called via MIDI to make this instrument even more versatile.